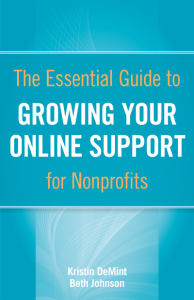 Nonprofits organizers know the key to success is a strong base of support. Supporters are the people who will open your emails, make donations, take action on your behalf and even volunteer for your cause. But how do you establish that base online? And if you already have a loyal following, how do you reach out to a new audience? This free ebook answers these questions and more, from locating potential supporters to crafting the right messages and even optimizing your digital strategy to attract attention. With this book, you discover how to getsupporters‘ attention, how to spread the word about your organization, and how to use the Internet to your benefit through advertising and search engine optimization. Start reaching your supporters and potential supporters today! Free download here or get a paper copy for a deposit.